HCB Earns Highest 5-Star Superior Safety Rating! 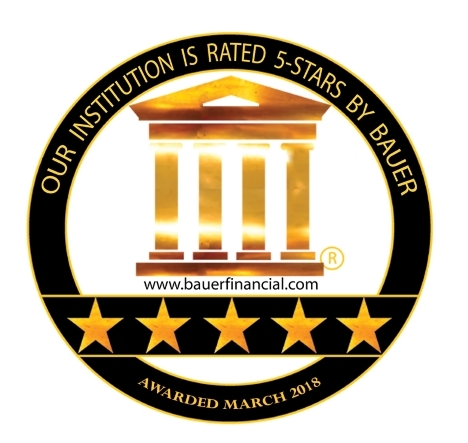 March 2019: Coral Gables, Florida, BauerFinancial, Inc., the Nation’s Premier Bank Rating Firm, salutes 5-Star Highpoint Community Bank (formerly Hastings City Bank), Hastings, Michigan for its continued financial excellence. Not only has Highpoint Community Bank earned Bauer’s highest (5-Star) rating for financial strength and stability, it has maintained that top rating for 38 consecutive quarters. Earning a 5-Star rating indicates this bank excels in areas of capital adequacy, profitability, asset quality and much more. Highpoint Community Bank was established in 1886, and has been building personal relationships ever since. Today, 133 years later, Highpoint Community Bank operates through seven conveniently located offices in Bellevue, Caledonia, Hastings, Marshall, Middleville, Nashville and Wayland and can also be found online at highpointcommunitybank.com. December 2018: Coral Gables, Florida, BauerFinancial, Inc., the Nation’s Premier Bank Rating Firm, is pleased to announce that Hastings City Bank, Hastings, Michigan has once again been awarded its highest (5-Star) rating for financial strength and stability. Earning a 5 -Star rating indicates this bank excels in areas of capital adequacy, profitability, asset quality and much more. Earning and maintaining this top rating for 37 consecutive quarters, makes its status indisputable as one of the strongest banks in the nation. Established in 1886, Hastings City Bank has been building relationships and providing personalized solutions for its customers for 1 32 years. Today it operates through seven conveniently located offices in Bellevue, Caledonia, Hastings, Marshall, Middleville, Nashville and Wayland and can also be found online at hastingscitybank.com. Mark A. Kolanowski, President and CEO, announced that Highpoint Community Bank will offer various relief solutions to customers who are federal employees and affected by the recent partial government shutdown. “Our role as a community bank is to provide solutions to meet the financial needs of our customers and the communities we serve. Government employees are likely to be struggling with the prolonged government shutdown and we want to do what we can to help lighten their financial burden” said Mr. Kolanowski. Customers who are federal employees and affected by this partial shutdown may call the bank at 1-888-422-2280 or visit any Highpoint Community Bank branch. September 2018: Coral Gables, Florida, BauerFinancial, Inc., the Nation’s Premier Bank Rating Firm, proudly affirms that Hastings City Bank, Hastings, Michigan has once again earned its highest (5-Star) rating for financial strength and stability. Earning a 5-Star rating indicates this bank excels in areas of capital adequacy, profitability, asset quality and much more. In fact, Hastings City Bank has earned and maintained this top rating for 36 consecutive quarters. Hastings City Bank has been making its neighbors its number 1 priority since 1886. Today, after 132 years, it is creating a better banking experience for customers through seven conveniently located offices in Bellevue, Caledonia, Hastings, Marshall, Middleville, Nashville and Wayland and online at hastingscitybank.com. Click image to view official copy of press release. Try our new State Street ITM – Interactive Teller Machine! Hours are 8:30 a.m. to 6:00 p.m. Monday through Friday and 8:30 a.m. to Noon on Saturday. Highpoint Community Bank is pleased to announce a partnership with Harland Clarke as our new check provider. We are confident that you will find an expanded selection of check styles at the same or reduced prices. When you are ready to order checks, you may use an online portal at www.ordermychecks.com, call us at 888-422-2280 or stop into any branch. We will be happy to help you. June 2018: BauerFinancial, Coral Gables, Florida, the Nation’s Premier Bank Rating Firm, is proud to announce that Hastings City Bank, Hastings, Michigan has once again secured its highest, 5-Star rating. (A five-star rating indicates the bank excels in areas of capital adequacy, profitability, asset quality and much more.) In fact, Hastings City Bank has earned and maintained this top 5-Star rating for 35 consecutive quarters. Established in 1886, Hastings City Bank has been investing in the future of its community for 132 years. Today it operates through seven conveniently located offices in Bellevue, Caledonia, Hastings, Marshall, Middleville, Nashville and Wayland and can also be found online at hastingscitybank.com. HCB Named one of West Michigan’s 101 Best and Brightest Companies to Work For! Highpoint Community Bank is honored to be recognized as one of West Michigan’s Best and Brightest Companies to Work For, for the 10th consecutive year!Click here to view official copy of press release. March 2018: BauerFinancial, Coral Gables, Florida, the Nation’s Premier Bank Rating Firm, is proud to announce that Hastings City Bank, Hastings, Michigan has once again secured its highest, 5-Star rating. (A five-star rating indicates the bank excels in areas of capital adequacy, profitability, asset quality and much more.) In fact, Hastings City Bank has earned and maintained this top 5-Star rating for 34 consecutive quarters. Hastings City Bank was established in 1886 and has been growing alongside its customers for 132 years. Today it operates through eight conveniently located offices in Bellevue, Caledonia, Hastings, Marshall, Middleville, Nashville and Wayland and can also be found online at hastingscitybank.com. ###BauerFinancial, Inc. P.O. Box 143520, Coral Gables, FL 33114.